Amesbury's route is out now! Download the new version (2.0) to play his route! What will fuel this Season's gossip? And will you be able to keep yourself from being burned by it? 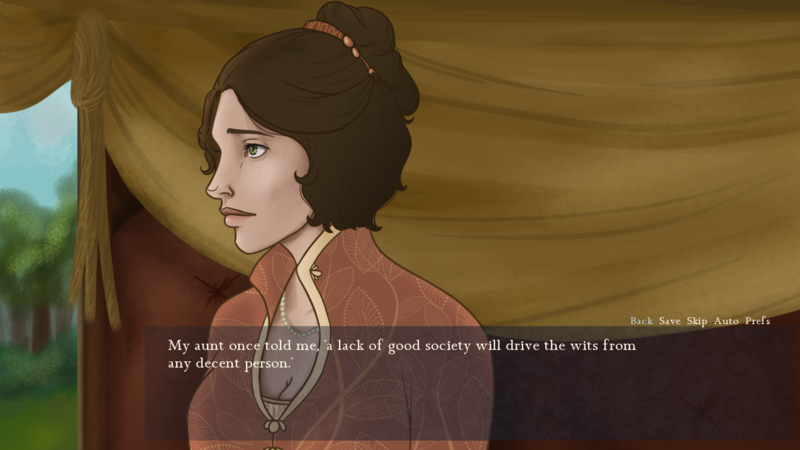 As the daughter of a Viscount, and heiress to a small fortune, you are invited back into society even after years of seclusion at your family's estate. The upcoming Season is to be spent in Bath, your childhood friend having finally convinced you into it, and only the cream of society will be there. But the fickle and difficult dance that is weaving through society can be a tricky thing to remember, especially when they thrive on any small misstep you may make. But which partner is selected to help guide you through the maze of the upper classes is always left down to The Lady's Choice. The Lady's Choice is a light visual novel set in Regency times and will be route based. 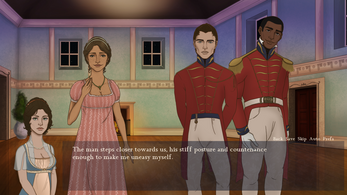 The goal is to give the feel of a regency romance novel, but an interactive one! Though it is a historical visual novel, it's not going to be completely accurate (for example, they didn't really have a Season in Bath). I have taken liberties because, well, I wanted to have fun with this rather than freak about every nuance of historical accuracy. This was started for NaNoReNo 2016 gamejam. This is one of the most enjoyable romance visual novel that I've read where romance between the MC and other characters are focal points. I can't stress enough that this is one of the best visual novel I've ever read. The art is gorgeous, the MC is absolutely lovable, and the love interests are really fun to read. Anyway, thank you so much for making me very happy by making this visual novel. Keep up the great work! Man, I would love a Mr. Montfort route if you ever come back to do more with this game. I've found walkthroughs for stanton and blake but is there one for Amesbury? An official one that is? This is a delightful game. I absolutely loved this vn! Beautiful artwork and intriguing storyline. Thank you so much. Dear god, I spent HOURS playing ! It's the best visual novel I've ever encountered...It left me grinning like an idiot and I enjoyed every bit of it. While reading the comments, I was quite surprised to find out Amesbury's route was the least favourite, as I found myself quite fond of the witty tongue of his. He was so much fun to be around, I could not resist :) The others routes did also ravish my heart, of course, but in a less enchanting way I must admit. The writing was a pure delight. This VN is truly a master peace. My apologies for such a rough review, but I'm speechless. Definitely one of my favorite VNs. I loved the writing most of all, it was a joy to read. Often I found myself scrolling back just to re-read what I thought was a particularly excellent piece of language. I played Stanton's route first, Guy's second, Amesbury's third. And that was the order in which I liked them, ha! I have no knowledge whatever of England in that time period, but nothing seemed amiss. I loved the friendship between Arabella and Sophie, and I rooted for her to be with Foxely. They were the cutest couple. I guess I liked Amesbury last because of what happened to Arabella. Stanton was definitely my favorite-I loved him, and his sister and her son. The art was lovely! Overall, an excellent VN. Keep up the good work! I love this game so much. Please tell me you will make more routes or another similar game. One of my favorite visual novels! The characters and their relationships with the MC are so enchanting, the art is spectacular and the writing gives off the most authentic feel! If anyone is looking for a high quality and guaranteed to deliver Otome novel this is what they've been looking for! This game blew all my expectations out of the water!! I came into it expecting beautiful art work and a decent light read and ended my first route with my heart actually racing. The writing was fantastic and perfectly descriptive, the dialogue flowed naturally and that art kept its beauty through the sprites, backgrounds, and cgs! And i don't know much about coding and soundtracks but the game played smoothly and the music fit the tone of the story and setting. The creators were truly talented. Okay well that was so fun to play! This reminds me so much of the romance novels I love to read! You did a wonderful job dear! Guy was my favorite because I always go for the tense kind clearly. I've tried this VN and I got to say that I love it. I only finished Lord Stanton's route and looking forward to trying out the other routes. I LOVE TWC as well so I am looking forward to Book Two! You've created a really wonderful game. If your goal was to have created a game with the feel of a regency romance novel, then you have succeeded with flying colors. This was a throwback to reading Jane Austen novels and I absolutely loved it. Lord Stanton was personally my favorite and Blake was a close second. I look forward to seeing what you create in the future. Love love love this visual novel! Swooned over every single on of the male characters. Have to say Blake was my favourite but quite enjoyed Isaac and Laurence as well. Can hardly wait for a new game by Seraphinite. Really enjoyed this one and Crossroads. But I'm so glad you could enjoy this game too! :) The more Regency romance games the better, right? Hehe! Eeee!! :D Amesbury and then Isaac were my favourite. Thank you so much for such an amazing game!! eee! SO CHARMING AND SWEET! Loved it! :D Still squealing now. I was a bit disappointed that there wasn't like a epilogue at the end explaining what happens after the ending. D: But great job regardless. Hey I just finished all the True Love routes and I am in awe. First I did Captain Blake's route and absolutely love how sweet and gallant he is (he is still mostly my favorite) but it was so exciting I was worried to try the others. I was thinking, "this was so good, now the others won't seem as good in comparison." Then I did Lord Stanton's route and I was so happy to have such a different but still exciting and thrilling story. So I thought "okay that was also super interesting and fleshed out and amazing, but Mr. Amesbury seems a bit dull, I'm sure he won't be as good." Then I did his route and I was like "okay these are all amazing and interesting with good plot and interesting characters and romance and excitement". It was still so good and fit with the whole game but took it in a whole new direction. I would like to say I am sorry for doubting you because you are amazing at writing these. Like I was so impressed that each story was so unique and yet still maintaining an interesting story for each. None of them are boring or feel just thrown in. And I especially love Arabella and Colonel Foxley always being together and super lovey-dovey, because it really creates a sense of these are all in the same universe, just different paths you take. (And tbh Arabella and Foxley are so cute omg, they both deserve so much happiness together.) Yeah, I'm sorry if this is really weird or long but I just wanted to say you and your game are amazing and you are so talented. Thank you for making it. 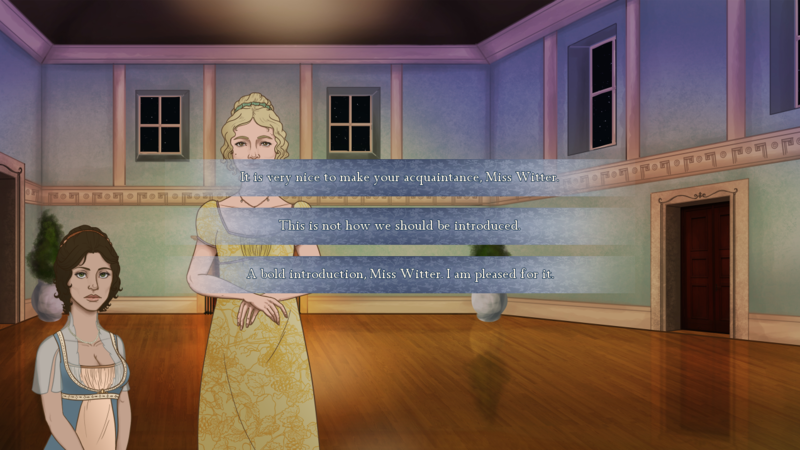 I have an ardent love for Jane Austen so playing a game set in her era really appealed to me and I'm glad I played it. I have played through all of the True Love ends and I love it! The choices and stories are wonderful. Amesbury is my favorite... I enjoy teasing and being teased back. He sort of reminds me of Henry Tilney from Northanger Abbey in some of the scenes here I go assuming everyone has read all of Jane's magnificent novels. Captain Blake is real sweet and deserves the world. I really, really wanted an option to punch Lord Huntington. I think I would rather marry Mr. Collins than him. Both don't get the hint but at least Collins eventually does and moves on. Lord Stanton I was uncertain about at first but I loved his route. It was fun yelling at the bad guys and being the hero, bonus points because Isaac didn't become huffy about a woman helping him. This was my first game from itch.io and first VN and I absolutely loved it! I find things from the past very fascinating so this definitely was up my alley. The only 2 things that bothered me was the mini image of "me" next to the texts all the time. I found that very confusing and had hoped you could turn that off. The other thing I would have liked was being able to change clothes and hairstyles. But I also understand how that can possibly be a bit harder to do. Although I'll still hope that if there is any new game in the works this can be incoorperated somehow. Anyway, am already following you and hope to see many more cool vns from you in the future! This is the first VN I've ever played, and I just have to say, it's amazing! I did Captain Blake's first and then Amesbury. Maybe I'm not playing it right, but I can't seem to find a proper ending to Stanton's story....I end up where he leaves and then it ends. I'll have to go back and try again. Anyway, well done! I just finished all three routes and I have to tell you this game was amazing! Not gonna lie, I may have cried once or twice....This is the best otome game I have ever played and I would love to see future expansion on it! Thank you so much for creating such believable, well written, well developed romances and friendships in the game. 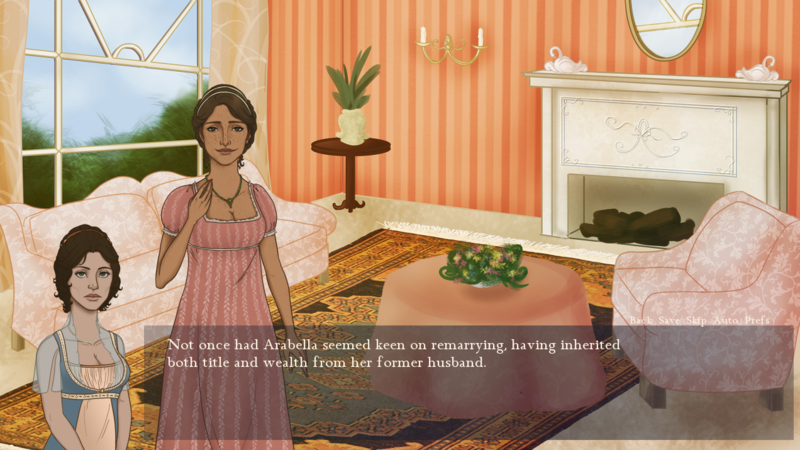 I adored Arabella and was thrilled when she and Ernest found their happiness :) Thanks again! I absolutely loved Isaac's route! I liked Amesbury the least? Made sense, since he was more playful compared to Guy and Isaac. A bit miffed that his actions eventually led to Arabella's injury. I can't stop feeling frsutrated that most of the negative consequences are avoidable? But then he wouldn't have gotten his route after all. Aaaaanyway, I can't believe you made most of this game from scratch. Artist, programmer, writer??? And all for free??? TEACH US YOUR WAYS, OH WISE ONE! But seriously. How did you find time during your time in school to self-teach yourself all this? I'm so glad you enjoyed it :D Thank you for playing it! That's odd :/ It should play fine, even with Ren'py software on your computer. Hm, I'm not sure what the problem could be as I don't own a Mac. Not sure why it would switch the avatar to the Ren'py logo. Is there an error message when you try to start the game? I kinda fell in love with this game. I already got all true love endings. It's greatly written and i hope it will expand in future. I have to say this is one of my favourites otome by far. Hi! Just wanted to let you know how much I adore everything about this game! The art is great, it is well written, the time period is everything, and I REALLY like that you can choose you own way to respond to stuff without it necessarly having an impact on the outcome - it makes it easier to identify with the MC, and makes the whole experience more realistic. Moreover I really like that it's not very hard to end op with the "good" ending (I've played/read some other VN's where I didn't end up with the ending I wanted and had to go back which just ruins it a bit for me). Like I mean... jeez... heh heh. I really like his story, his broodyness, his looks, and the sensitive fellow underneath. I also really loved how well he responded to my humourous answers. He just has so many layers that one. I also played Staton's route which was sweet, and will of couse play Amesbury's soon! After I finished this VN I found out you made another (Crossroads), and I just finished that one as well. Reeeally great!! A whole different setting but still loved it, and the character customization was a nice touch! So... this ended up really long but I just had to let you know my appreciation of your work. And I REALLY hope you're planning/working on more projects!? Oh wow! Thank you so much for such a wonderful comment :D It's so motivating to know that people are enjoying what I create! I loved this so much! My favorite route is Amesbury's but I did love Guy and Stanton too! Thank you so much for trying it out and leaving a comment! I'm really glad you managed to enjoy the parts you played to that certain point :) I hope the bad ending suited... they're always the toughest to write! Oh jesus, I loved this. I've only played the Amesbury route as it was what attracted me right off the bat, but I'm extremely excited to play the other ones. The writing in this piece is very elegent and had me sucked in from the first sentence. I believe there is one spelling mistake during the route, towards the end, I think Laurence's sentence should be "a sentiment I share", but it says "I sentiment I share". Not sure, please don't take offense, as this is a lovely piece. Aah, thank you so much! I'm really glad you liked it :) I really tried to make the writing style fit the theme of the VN, whilst also making it easy for a modern audience to read. (Also, urgh about the spelling error! Thought I'd managed to catch them all! Thank you for that :D ). I'm so glad it drew you in and had you feeling the emotions :D Writing the different guys was fun, and it's nice they were appealing!